Publisher: Mariner Books, Harcourt, Wilmington, Massachusetts, U.S.A. It is the summer of 1905 and Jim Stringer is copiloting a special train filled with overheated excursionists headed to Blackpool, the seaside resort on the English coast. At the moment when the train picks up speed, a huge rock comes into view farther down the tracks; it lies directly in their path. Full stop of the engine; full steam ahead with the mystery. <br /><br />As he did in The Necropolis Railway, Stringer doffs his railway hat and dons his detective&#x2019;s derby, assisted once more by &quot;the wife&quot; and her brilliant detecting skills. 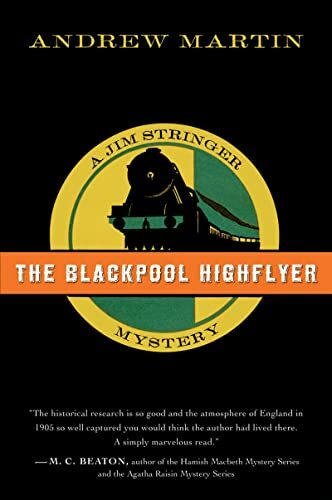 Capturing the world of railway stations and locomotives during the Edwardian Age, The Blackpool Highflyer carries readers to a place where dark shadows lurk behind innocence and the solution to the mystery waits at the end of the line. ?A compelling thriller . . . A stunning achievement.&#x201d; ?<i>Daily Mail </i>(London)<br />&nbsp;<br />?A clear winner in literary crime writing.&#x201d; <i>?Daily Express</i> (London)<br />&nbsp;<br /><i>&nbsp;</i>From the author of <i>The Necropolis Railway</i> comes another atmospheric thriller of sabotage, suspicion, and steam. Assigned to drive vacationers to the seaside resort of Blackpool in the hot summer of 1905, Jim Stringer is happy to leave behind the grime and danger of London life.&nbsp;But his dreams of beer and sun are dashed when someone attempts to derail his high-speed train. Soon Jim and his brilliant wife are after the saboteur, learning all too late that a dark secret waits for them at the end of the line.<br />&nbsp;&nbsp;<br />PRAISE FOR ANDREW MARTIN<br />&nbsp;<br />?Andrew Martin succeeds brilliantly at re-creating a railwayman's lot in London in [the early 1900s].&quot; --<i>The</i> <i>Seattle</i><i> Times</i><br />&nbsp;<br />?Martin does a stunning job of bringing to life the era when steam locomotives chugged from London through the British countryside.&#x201d;?<i>Booklist</i><br />&nbsp;<br />&nbsp;<br />ANDREW MARTIN was a Spectator (London) Young Writer of the Year<i>&nbsp;</i>and&nbsp;is the author of <i>The Necropolis Railway</i>, the first novel featuring Jim Stringer.<i> </i>He lives in London.